Meyers lemons are in season and an incredible way to preserve their flavour all year is to ferment them. A staple in Moroccan cuisine, preserved lemons are fermented in salt and acid. The acids from the lemon juice and fermentation process soften the lemon rinds and create the most incredible flavour. I love adding them to sautéed veggies, grating them into dressings and soups and, of course, using them in Moroccan dishes. You can make this recipe with any type of lemon or lime, but I love Meyers lemons the best. They’re slightly sweeter than regular lemons and their rind is a little thinner and softens wonderfully in the ferment. Without cutting into flesh, trim both tips of 3 lemons. 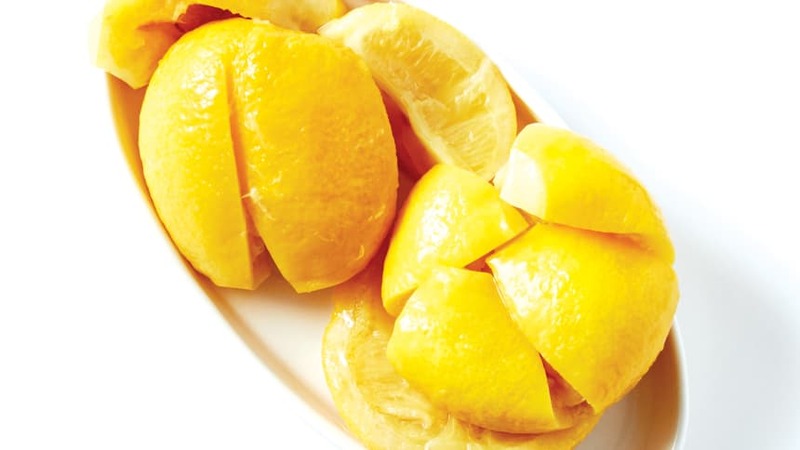 Arrange 1 trimmed lemon with 1 cut side down. Carefully slice almost but not all the way through to bottom of lemon. Turn lemon 90 degrees and slice almost but not all the way through to bottom of lemon. Repeat with remaining trimmed lemons. Sprinkle 1 tsp salt into center of each cut lemon. Arrange 1 cut lemon, cut side down, in a 16-oz wide-mouth glass jar. Using a spoon, press firmly on lemon to squeeze out juice. Sprinkle 1 tsp salt over top of lemon. Repeat with remaining cut lemons and salt, stacking lemons in jar. Juice remaining 2 lemons and pour juice into jar. Fill a small glass jar with water and seal tightly with lid. Place in 16-oz jar over top of lemons to keep lemonssubmerged in liquid. Place 16-oz jar in a shallow bowl to catch any overflow and cover with a clean tea towel. Let ferment in a cool place away from direct sunlight for 4 to 6 weeks. Remove small jar. Seal 16-oz jar tightly with lid and refrigerate for up to 12 months.